The Old Jail Art Center presents a lively slate of exhibitions annually; both historic and contemporary. The Old Jail Art Center invited Baltimore artist René Treviño to consider the museum’s Pre-Columbian artifacts in the creation of a site-specific body of work. With this installation, A New Codex incorporates Treviño’s multi-media work alongside his personal selections from the OJAC’s permanent collection. Utilizing extensive research of Mayan and other cultures’ carvings as well as imagery and objects from the museum’s pieces, Treviño develops contemporary images from Mesoamerica’s ancient steles and codices. He then combines these forms and symbols with those derived from popular culture. 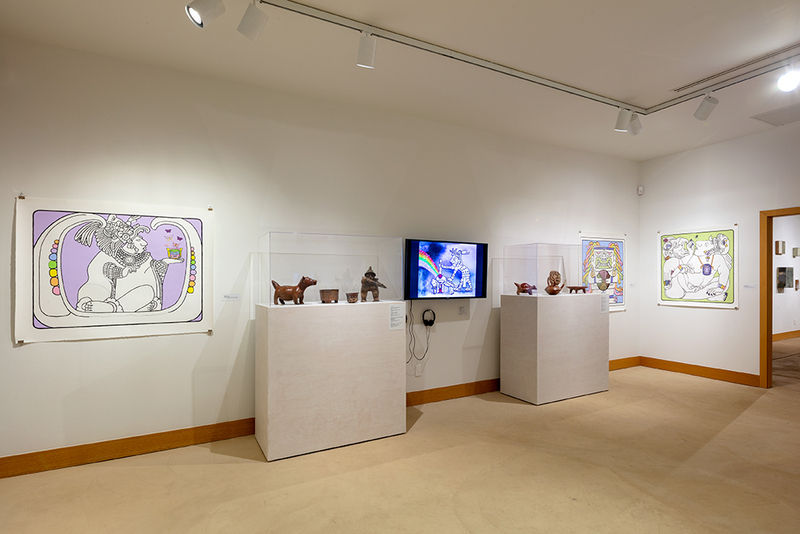 Many of the figurative objects in the OJAC’s Pre-Columbian collection become the “players” in Treviño’s drawings and animations. 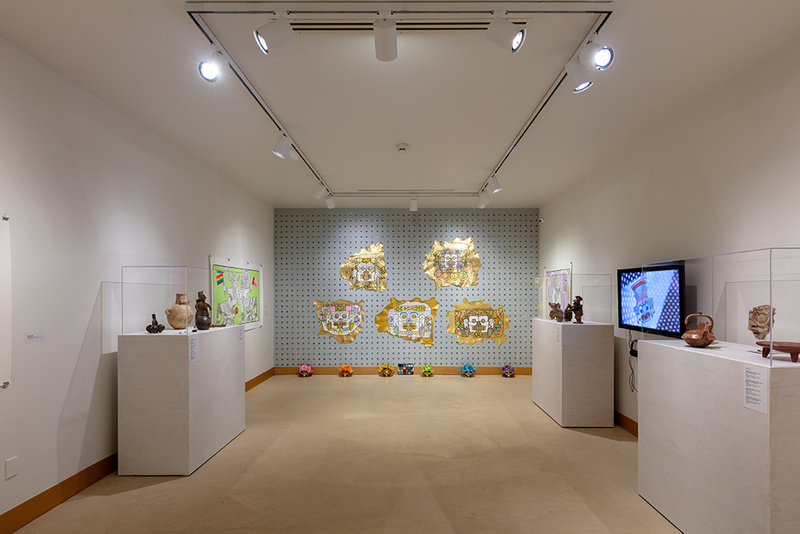 Placing his own works in the same context as the artifacts challenges viewers to see and seek relationships between the ancient and contemporary. The result is an artist’s created world that references our past and speaks to our present and future. Though using ancient imagery as a starting point, this imagery is eventually filtered through a contemporary popular culture and art historical context via the artistic process. The original depictions of the ancient Pre-Columbian peoples’ religious rituals are often dark, such as communicating with the dead, bloodletting, sacrifices, etc. Treviño includes some of this content, disguised somewhat by injecting super-saturated color, gold, rhinestone appliqué, and a touch of humor. One of the goals for this multi-media exhibition is to create a stimulating interplay between the ancient artifacts and his contemporary creations. History is subjective; there are many blurred lines and much distortion. Context and point of view are very important subjects for this installation. One person's hero is another person's villain, depending on who tells the story. Using a historical context as a backdrop for his work, Treviño seeks to re-weave these "lessons" of the past. The more layers that he presents, the closer he feels he can get to something that might resemble truth. Installation images by Kevin Todora. René Treviño: A New Codex is generously supported by the National Endowment for the Arts with additional support from Anonymous, Erin Cluley, Pam and Bob Tidwell and Travis Vandergriff. Allied presents works from the Tia Collection of Santa Fe, New Mexico “paired” with those from the permanent collection of the Old Jail Art Center. The connections between the works range from blatant to subtle. Some groupings present artists from different cultures or eras who investigated similar themes, or that elicit similar moods through formal devices. Other times, the juxtapositions can involve artists who use traditional approaches to image creation with those who utilize unconventional mediums. 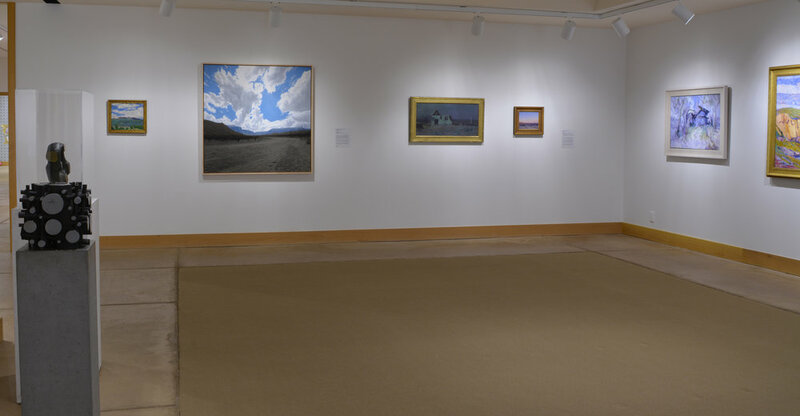 Regardless of the viewer’s pictorial or thematic discoveries, an appreciation and recognition of connections from two seemingly dissimilar collections emphasize that both are generous gifts for audiences to contemplate and enjoy. The Tia Collection of Santa Fe, NM was created with the exclusive intent to share an individual collector’s love for art across a variety of genres. The collection is curated and administered by Laura Finlay Smith who works closely with the anonymous collector to continuously add to the Tia collection, and also with institutions to generously share the eclectic holdings of outstanding artists’ works. Allied is supported in part by John & Ginger Dudley, Clayton Henry, and Sally & Robert Porter. Image credit: RALPH MEYERS, Early Spring, N.M., 1922, oil on board, 9 7/8 x 12 5/8 in. Tia Collection. Matthew Bourbon is curious about the diverse “languages” in painting. His works since 2005 have combined description or “realistic” information, adopted from a variety of visual sources, with areas of purely abstract forms. These areas of abstract forms obscure the information normally used by a viewer to decipher the narrative. For Bourbon, the coexistence between the two within a scene is a source of fascination—as he contemplates how images are understood or misunderstood. Recently he has all but eliminated the figurative elements that lend themselves to narrative and has begun to investigate “pure” abstraction form. Bourbon realizes that abstraction has much to offer as a carrier of content and language. Originally from the San Francisco Bay Area, Matthew Bourbon earned separate undergraduate degrees in Studio Art and Art History from the University of California at Davis. Relocating to New York City, he earned his Masters of Fine Arts degree from the School of Visual Arts in 1999. Since then, his art has been exhibited nationally and internationally. Bourbon is a Professor of Art at the University of North Texas' College of Visual Arts and Design. He is also an active art critic and has contributed to Artforum Online, Flash Art, ArtNews, New York Arts Magazine and KERA Art and Seek. The 2019 Cell Series is generously supported by McGinnis Family Fund of Communities of Texas in loving memory of Juli Weida McGinnis, 1941-2018, Kathy Webster in memory of Charles H. Webster, Barbra & Jay Clack, Susie & Joe Clack, Jenny & Rob Dupree, Patrick & Amy Kelly. Image credit: MATTHEW BOURBON, Reconstruction Days, 2017, acrylic on canvas and wood slats, 46 x 36 in. Courtesy of the artist. PK: I would first like to ask about your background—where you were raised, your formal (or informal) education, and what brought you to Texas. MB: I was raised in northern California in a small town about an hour south of San Francisco. Like many artists, as a young person I had an affinity for drawing and painting. My mother and uncle are painters—so I saw and appreciated how paintings were made. However, I never considered art as a life pursuit, until I witnessed professional artists working while I was attending UC Davis. At first, I thought I would transfer from UC Davis to UCLA to become a filmmaker. I had made a series of short films with friends in high school, and because of my interest in movies, it seemed like a reasonable place to direct my ambitions. After taking the only film class at UC Davis (which was housed in the Art Department), my eyes were quickly opened to the possibility of pursuing what I always loved—drawing and painting. I stumbled into an amazing art program, taking courses from artists like Wayne Thiebaud, Squeak Carnwath and Roy De Forest. This was my first exposure to people who were deeply connected to the daily practice of making art. After changing majors and earning separate degrees in Studio Art and Art History, I moved to San Francisco and painted in a small bedroom studio until I applied to graduate school. I was accepted to various programs, but the lure of New York City was strong, and I ended up going to the School of Visual Arts in Chelsea. Being in New York was fantastic for a young art student. SVA had several faculty that had a large impact on me; I recall that Jerry Saltz would take us around the city and we’d sometimes hold class in Soho and Chelsea galleries. Being in front of quality work and seeing so much variety helped clarify my own values as an artist. Looking back, Jake Berthot and Gary Stephan were also instrumental to my education; both pushed me to get past some artistic hang-ups that helped redirect the trajectory of my work. It was also at this time that I started writing reviews of other artists' exhibitions. I landed a job as a paid writer at New York Arts Magazineand wrote hundreds of short reviews. Writing about so many different artists really places you in the means and methods of other people. It proved a big part of my training as a thinker and educator. After earning my MFA, I taught foundation level art courses at a small private school in New York. Meanwhile, I applied to teaching gigs around the country. The reason I ended up in Texas is really due to the artist Vernon Fisher. I applied for a Painting position at the University of North Texas, primarily because I knew Vernon taught at what is now the College of Visual Arts and Design. I respected Vernon’s work, having seen it in New York. Coming from Manhattan, I had no real sense of North Texas, but I knew I did not want to be too far outside of a major city. I figured if Vernon taught at UNT then it was worth offering my application. Long story short, I was hired in 2000 and have been here ever since. I feel fortunate to have come to a state with so many great artists, a healthy gallery system, and major arts institutions. Texas has been good to me. PK: Having experienced the east and west coast art worlds, was there anything about the “Texas scene” that stood out...either positive or negative? Also, in the 18 years you have been here, have these changed or remained constant? MB: When I moved from New York to Texas, the differences felt cultural. I would go to a store or restaurant and people were authentically friendly. I was accustomed to mild disinterest in New York. It is a bit of a cliché in both directions, but I certainly felt the change. As for art, the differences were mostly about the openness I experienced in the Texas scene. New York, especially larger Chelsea galleries, can feel a bit sterile and intimidating. The people running the spaces are under such financial pressures with the cost of NY real estate, that they can be curt or aloof to the “regular” visitor to their space. It is also about the scale of the market; the generally smaller gallery operations in Texas allow for a more human touch. I also believe the barriers for an artist to enter into the gallery system are lower in Texas. Many galleries here are true labors of love, or DIY spaces that have more freedom and willingness to try their hand at “undiscovered” talent. Texas sometimes, and in certain places, has a conservative streak in what gets shown, promoted, and collected, but there are plenty of pockets of boldness that are very appealing about our locale. In the time I have lived here, the scene has been relatively constant. Galleries have obviously come and gone, but new ones arise and a vibrant arts activity always seems to be percolating upward—perhaps from the abundance of university programs—as much as other causes. PK: Was there a recognizable visual or conceptual shift in your work after your “Texas arrival?” Can you describe your work prior to that and how it has evolved since? MB: I am always focused on what’s in the studio at the moment, but if I reflect back on the past 18 years, there’s been a gradual transition in my work. When I first arrived in Texas, my paintings were based directly on fragments of old film stills and advertising photographs. In the paintings from this time I was intent on altering my source material and changing or highlighting the potential meaning inherent to the original image. As the years passed I began to adopt a wider vocabulary of sources, and I became increasingly interested in combining descriptive painting with areas that are more or less “abstract”. Around 2005, my driving curiosity became using diverse visual languages to see how they could coexist within a discrete scene (usually of people in rooms), and how obscuring “realistic” information could lead to a more open way of interpreting what is depicted. I was, and continue to be, fascinated with how images are understood or misunderstood. Recently I have moved away from using obvious figurative elements in my paintings, which is a significant shift in my process. While I’m still thinking of competing visual languages, and “abstraction” as an active force in my paintings, I’m now seeking a framework that is more elemental. The new paintings have a nominal perceptual reality, but I’m no longer motivated by larger ideas of narrative, nor am I adhering as strongly to the rules of traditional descriptive painting. My work for the Cell Serieshas me thinking about fundamental ideas of sculpture as object, architecture as body, and simple forms as potential carriers for the entire world—albeit through the lens of painting. As a long-time meditator, I think this new work is also impacted by the stillness associated with regularly sitting zazen. PK: What do you mean by “…simple forms as potential carriers of the entire world…”? 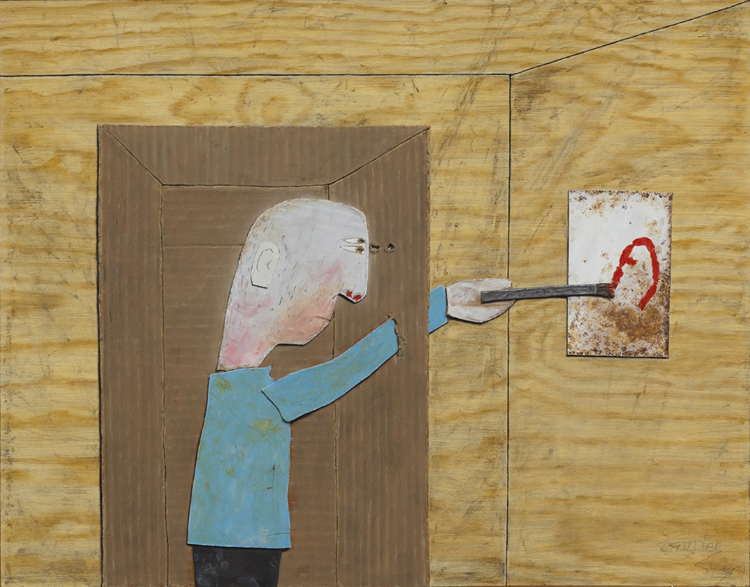 MB: What I am trying to convey is that the work in this exhibition does not rely as heavily on a dialogical relationship between different styles of painting and different subjects to suggest meaning. Instead, I am using basic forms as carriers for all of my content and material concerns. I guess it is like looking at the world through a quantum understanding—everything is in a state of flux, but all is made of the same sort of constituent parts. Consequently, in these current paintings a large basic shape depicted within a canvas can simultaneously stand in for architecture, an industrial designed object, or even a landscape. PK: At this juncture, I likely have only viewed one or two of those “newer” images to reference. Can you describe one work and tell how this concept you just mentioned visually manifests itself? MB: As I get older, I have more doubts about the world around me, including my relationship to art. The experience one naturally accumulates with age has led me to want my paintings to sit more directly in a place of not knowing. This manifests, as I said before, in using rudimentary forms as the jumping off point in my new work. It is a kind of inward looking to see outward. The invitation to exhibit in the Cell Seriesled to a perhaps obvious projection on my part—imagining a human being as a prisoner confined in a small cell. The forced restraint of being held within a jail mirrors a kind of restraint within the new paintings. For instance, in the painting Greeting the Doldrums, I was thinking about the elementary shapes found in Japanese rock gardens. I like how the large boulders in these gardens are meant to be themselves, but they are also meant to be islands, and imaginably even people. I’ve always relished the gamesmanship of competing meanings in art, but with Greeting the DoldrumsI was trying to create a painting that on the surface was uncomplicated. It is a bit like the Morandi-model of making art—take a basic thing (bottles) and let the way one paints those items carry more of the meaning. I am not as monkish as Morandi, but that type of reserved sensibility has been creeping into my practice. Because of this shift in my approach, the work for this show is less about overt references and associations internal to each painting, and rather more about finding some essential stimulation—to generate some heat, some life, from the most mundane of circumstances. Perhaps like generating a life for oneself while held prisoner within a cell. Though born to Texas artists Terry and Jo Harvey Allen, Bale Creek Allen has developed his own personal visual language utilizing diverse materials and mediums. He discovers and brings to our attention objects and scenes that often go unnoticed but contain deep meaning. Cast bronze tumbleweeds and tire treads along with photographs of forgotten places and discarded objects are his most recognizable subjects. His works invite us to consider where we have been, where we are, and where we might be headed. Image credit: BALE CREEK ALLEN, Koko Inn Pool, 2016, digital print on archival paper and board, 45 x 66 x 2 in. Courtesy of the artist. Nobody’s Foolfeatures artists that employ the technique of trompe l’oeil (from the French phrase “deceive the eye”) in their work. The concept of depicting objects as though they exist in three-dimensional space has been around for centuries in art. Yet contemporary artists often create an additional level of content by adding visual references of events, situations, and observations related to our current world. OJAC programs and operations are generously supported by it’s members, donors, the Still Water Foundation, T.J. Brown and C.A. Lupton Foundation, and the Texas Prairieland Foundation. © 2017 Old Jail Art Center. All rights reserved. Site Design by Bridge PR.